We are in the strawberry season and I am mad trying to have enough stock of them in the freezer. 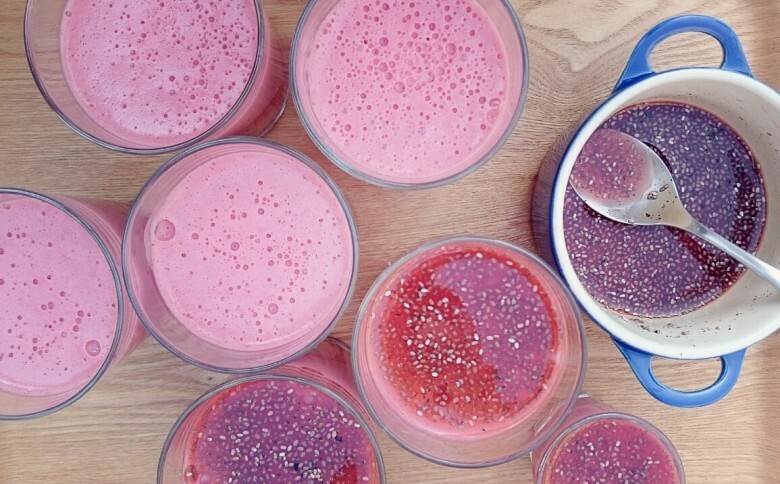 One of the best investments you can do is to freeze your own organic red season fruits. 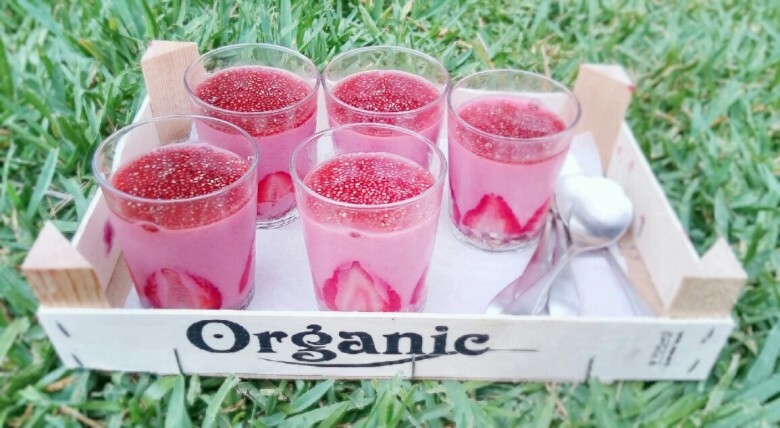 I emphasize that they must be organic because the strawberry is one of the fruits which include more pesticides and besides that, they don´t have a protective skin either. A real shame, because the strawberries contain a high amount of vitamins and antioxidants and are absolutely delicious when they have been allowed to ripen in a natural way. And so when the summer comes and the season starts: strawberries, blueberries, raspberries or blackberries (more in the late summer), I drop by the market and buy as many as I can or I go to a bush camp and collect many of them and bum!, put them in the freezer to make sure that their food attributes are almost kept intact. I don´t usually make jam but I do use them to make sorbets or ice creams, add them to the oats soaked at night (for example, in the bicher muesli), add them to a muffin or some pancakes, use them in a sauce…there are endless possibilities. I always keep a part of them outside the freezer and we enjoy eating them like that, as if they were God´s pleasure. I got this recipe from some memories of my childhood, when the strawberries were still a symbol of a particular season and not something available during the whole year. When the season arrived, my mother used to marinate them with vinegar and sugar. I will always remember the sweetness with a sour touch of the juice they released, we were always fighting over it! In special occasions, we ate them with vanilla ice cream and then, we passed out of pure pleasure. And so, thinking about those memories of my childhood, it occurred to me that I could add it to a sort of panacotta recipe but more healthy and light, because I was already thinking of replacing the whipped cream with almond milk. In fact, you can make the almond milk recipe of this blog but without using cinnamon. If you buy it, you could also use rice milk, or even coconut milk in case you want it creamier. The base of sunflower seeds gives it a crunchy touch and a bit of a contrast and you can also make a sort of cake, if that appeals to you. If you like the base, you can double the amount, make balls out of them and get some super energy balls! As you can see, this is a 2×1 recipe. Try to buy the agar agar in powder (non-bleached) and make sure that in the label it says only, “agar agar”. I have tried to make it with agar flakes, mostly because they are easily found in the herbalists, but I´d rather use powder instead, I am more used to it and it seems to be less complicated. And now, keep enjoying everything the nature offers us in every season. I can´t wait to try a few of the loquats which start to be available right now in this Majorcan land. 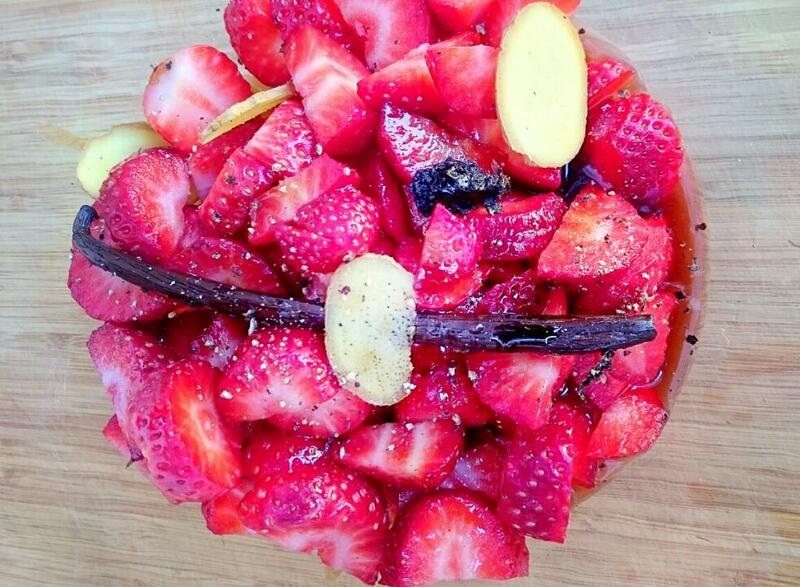 In a glass bowl, marinate the strawberries (previously cut into 4 pieces) together with the rest of the ingredients, with the vanilla pod scraped, leaving also the whole pod inside and cutting the ginger pieces because (they will be removed them afterwards). Let it stand for about 2 to 4 hours. For the base, melt the coconut oil. Grind the sunflower seeds and the almonds in afoot processor (at intervals of 4 seconds), without allowing them to become powder, until they get a small crunchy texture. Add the rest of the ingredients, except the dates. Grind for about 4 seconds more. Add the dates one by one until you get a sort of dough that will become a ball if you press it down. Fill 1 centimeter at the bottom of the small glasses, pressing a little. Cut the remaining 250 grams of strawberries and press well every half against the walls of the glass, as a sort of suction pad in order for the cream not to slip through it. Let it stand in the fridge. 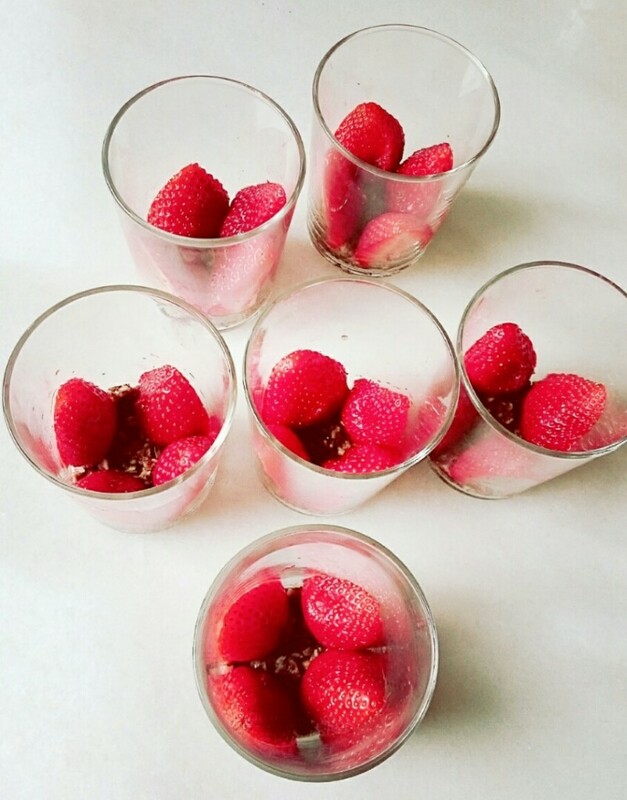 To make the panacotta, take back your bowl of marinated strawberries and remove the vanilla pod and the ginger pieces. THIS IS VERY IMPORTANT! Take 5 tablespoons of the marinated juice and put it aside in a small bowl. Grind the rest of the strawberries and the juice with the 210 gr of almond milk. Heat the 100 grams of almond milk and mix in a small bowl the agar with the coconut sugar, so it can help dissolve it better. When the milk starts to be hot, throw the agar as in a rain and stir until it starts boiling. Stirring constantly, let it boil for about 10 seconds and remove it from the fire. It is very important that the agar agar boils properly for it to curdle well. Add half of the liquid mix of the strawberries to the ladle, stir it well with a kitchen stick and add it to the robot with the rest of the strawberries. Grind everything for about 5 seconds and pour it over the glasses. Let it sit in the fridge for about an hour. Add the tbsp of chia seeds to the juice you had put aside, stir it well, let it stand for about 5 minutes and stir it again. If the panacotta in the glasses has already set , put a couple of small spoons of the chia mixture in each glass, just enough to cover the surface. Let it cool well and enjoy!.